Nelson, South Island, NZ. 6th March 2015. The town of Nelson is one of the gems of New Zealand. Many parts of NZ have their own micro climate, it’s that kind of country. 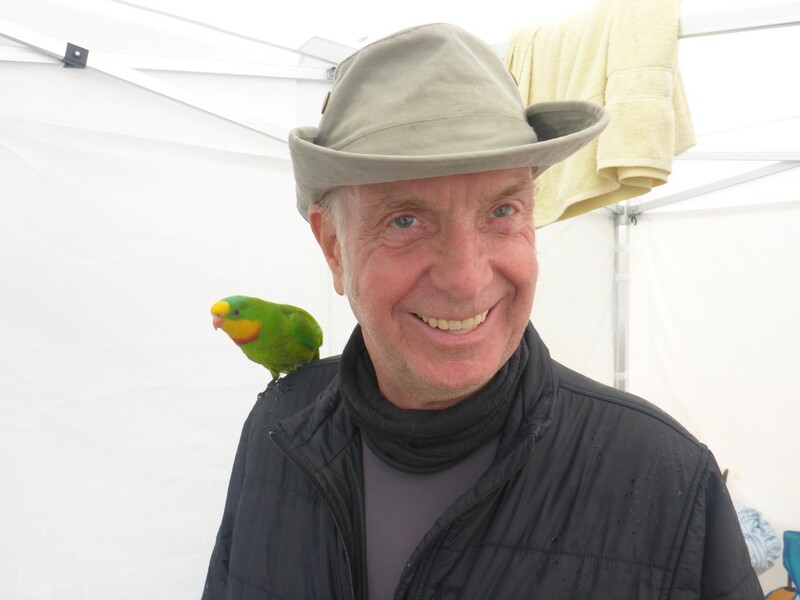 Nelson enjoys NZ’s highest number of sunshine hours per annum and I was delighted to enjoy plenty of them as Guy’s guest. He has a three bedroom bungalow, a small-ish garden but with a garage and plenty of storage space for all his bikes. He has a road going Suzuki, his racing Ducati and a Yamaha V4 two stroke, which he hopes to race in the Isle of Man someday. Back in the 1990’s Guy used to be a very competent sidecar racer and has toured the continental circuits as both driver and passenger. He has two Bronze Replicas from the I.O.M. TT, which are awarded to racers who finish in a time that is between 5 and 10% of the race winner’s. They sit in a very full trophy cabinet. Guy’s remaining ambition is to complete a 100mph lap of the Isle of Man course during a TT race. He holds two bronze replicas? In my eyes he has nothing left to prove! I remember Guy talking about his racing days when we were both at the AA, and the tales he told while I was staying with him still amazed and entertained me. n and when he came out to NZ he got work straight away with the AA, at first undertaking Warranties of Fitness (MOT’s) but now as a breakdown patrol. 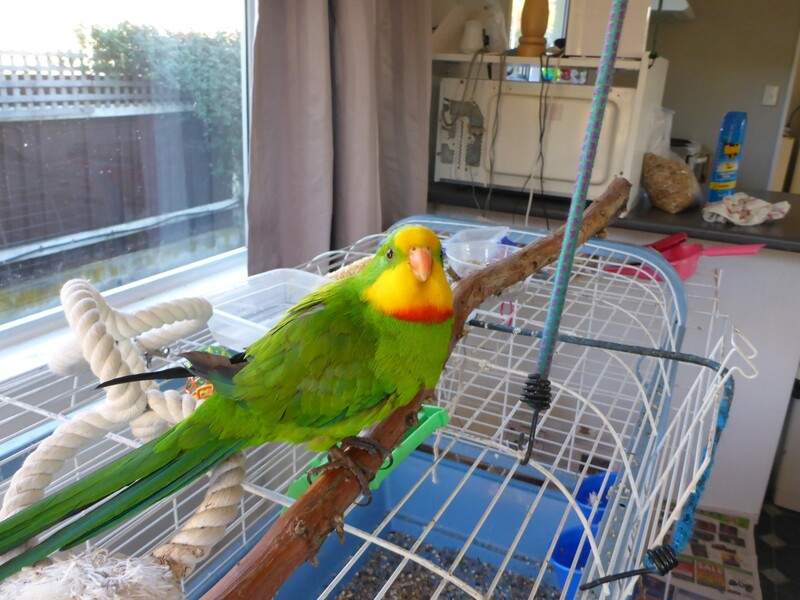 He and his family are very well settled and gave no desire to return. Bronwyn is Guy’s close friend and I was immediately impressed by her choice of bikes. 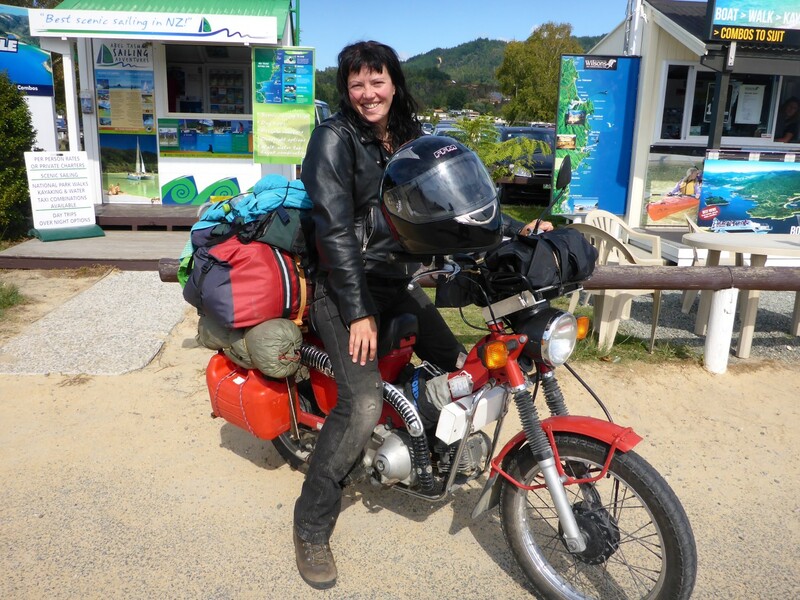 She rides a Moto Guzzi Mk1 Le Mans and has several other Guzzi’s in her garage. She used to work in Personnel but became disillusioned when it changed to HR and humans became merely resources instead of persons. She was brave enough to do something about it and although past forty, she packed in her job and took an apprenticeship as an aircraft technician. She now works at the local airport inspecting airframes and servicing engines. 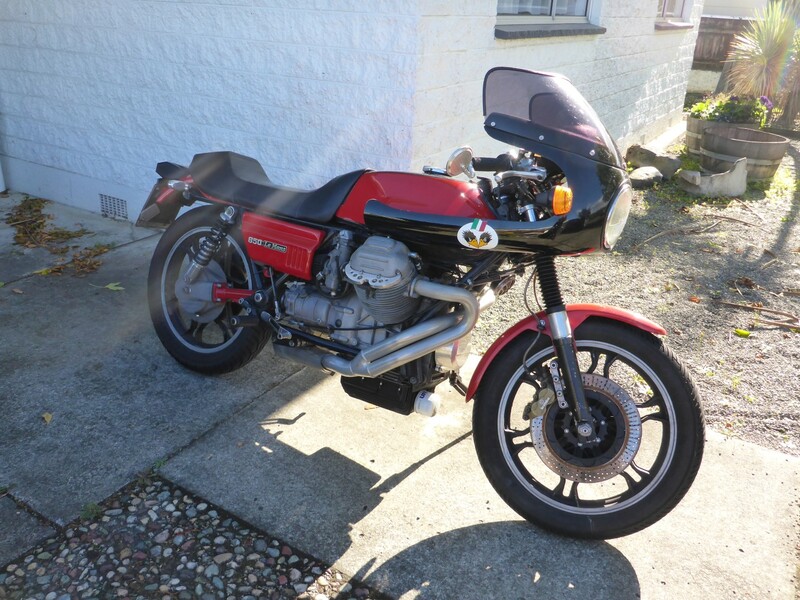 A Guzzi aficionado’s dream machine – Mk1 Le Mans. I had a great time while I was at Guy’s. The firstday there Reg escaped from the house, twice, and was fortunately found again, the second time with the help of some local kids. On weekdays he would go into work with Guy, usually sitting on his shoulder as he cycled through Nelson, much to the amusement of the locals. I went out and bought some oil so Doris got serviced once more. I also discovered that the rear wheel bearings have worn out again, so that’s a job now on the list to do, probably when I get to Australia. That evening Guy, Bronwyn and I went out for a delicious Indian meal and I think I may have persuaded them to follow my advice and take a trip with Blazing Trails Tours up into the Himalaya. Time will tell on that one. A very beautifully restored Chris Craft. 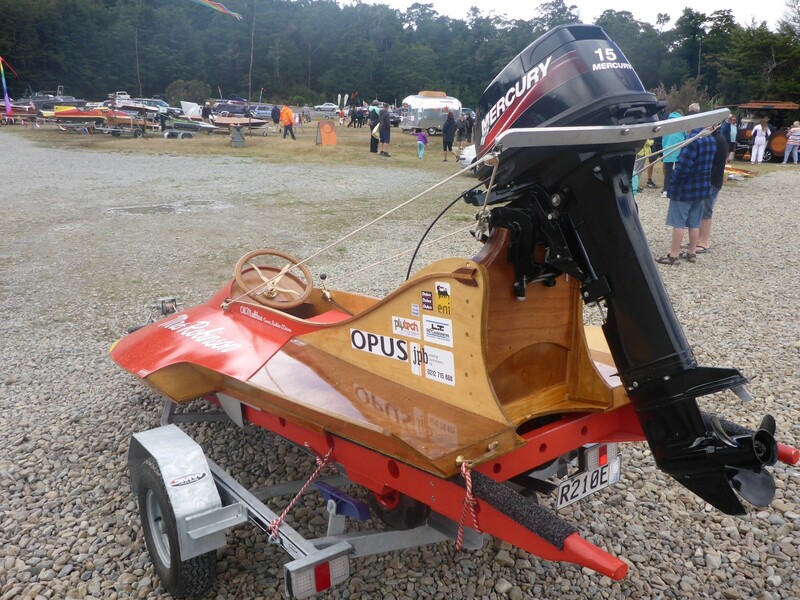 Next day was Sunday so we rode the bikes out to lake Rotoiti, a 90km ride up into the hills, where the annual Classic Boats weekend was taking place. There were various events underway out on the lake but our interest was captured by the various craft we could see on land. 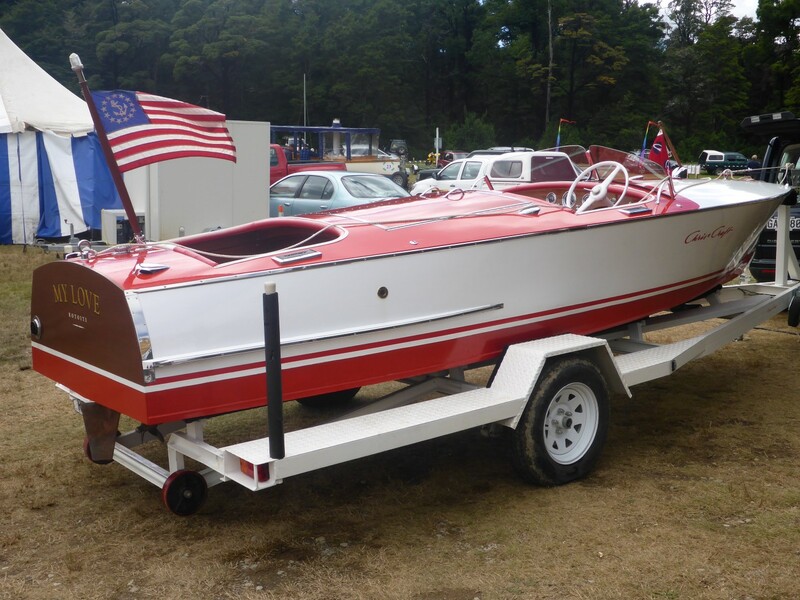 Nicest looking by far was a 1940’s Chris Craft, an iconic American speedboat, this one made from wood and immaculate in red and white. As someone remarked to me, you could imagine the Kennedys sitting in it. 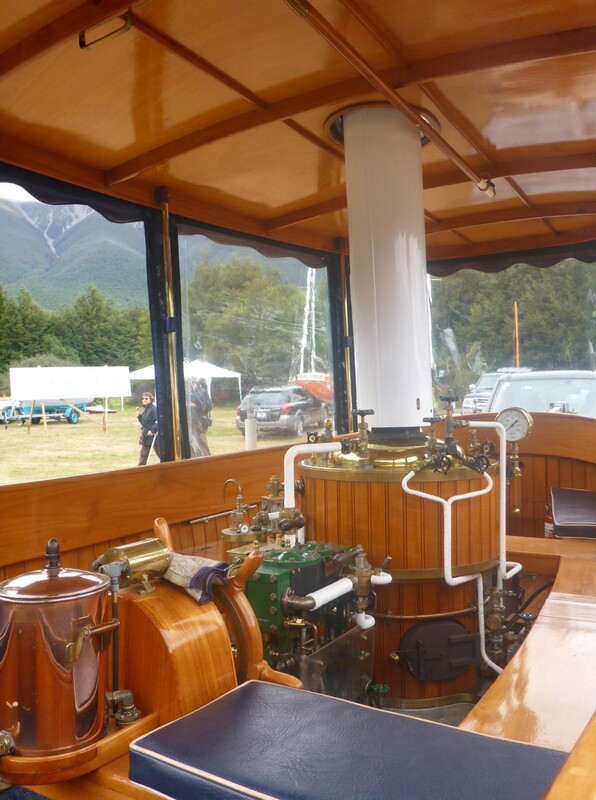 We saw steam powered boats, all shiny wood and polished brass and, at the opposite end of the development scale, jet powered boats too. There were a number of boats whose function was simply to go as fast as possible across the water during speed record attempts. They looked more like surfboards with big engines than proper boats. A surfboard with an engine on it – built for pure speed. Designed for chugging along gently – steam power. 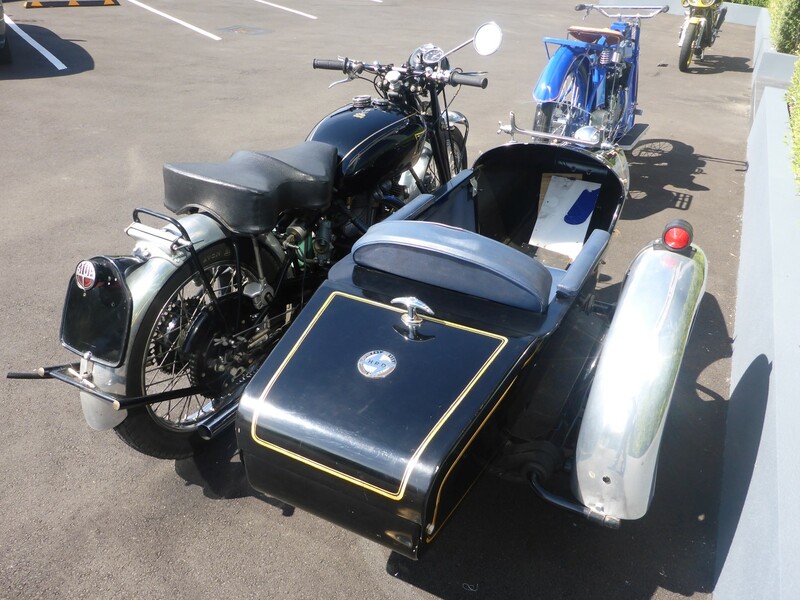 Guy spotted a Konig two stroke outboard motor and that set him off reminiscing about his sidecar racing days. He used to use a motorcycle version of this engine. Behind its development sits a real Kiwi story concerning Kim Newcombe, coincidentally born in Nelson. Kim went to the Konig factory in Germany and developed the outboard engine into an extremely successful motorcycle racing engine, for both solos and sidecars. Tragically, Kim died at a race at Silverstone in 1973, back in the days when racetrack owners and race officials didn’t really care too much about driver/rider safety. If you’re interested in Kim’s amazing story, find out more here. http://www.odd-bike.com/2013/04/konig-500-gp-outboard-powered-underdog.html When we got back to Bronwyn’s house she showed me her Moto Guzzi projects, something to keep her busy on her days off. Left to my own devices while Guy was at work, I gave Doris a mega clean up and degrease. Then I emptied all my panniers and removed all traces of mud, grass or any other organic material, ahead of taking everything into Australia. I’d heard that the quarantine inspectors there can be mighty particular and I didn’t want to take any chances. Over the next couple of days I went out to see some of what Nelson had to offer and it proved to be quite a lot. 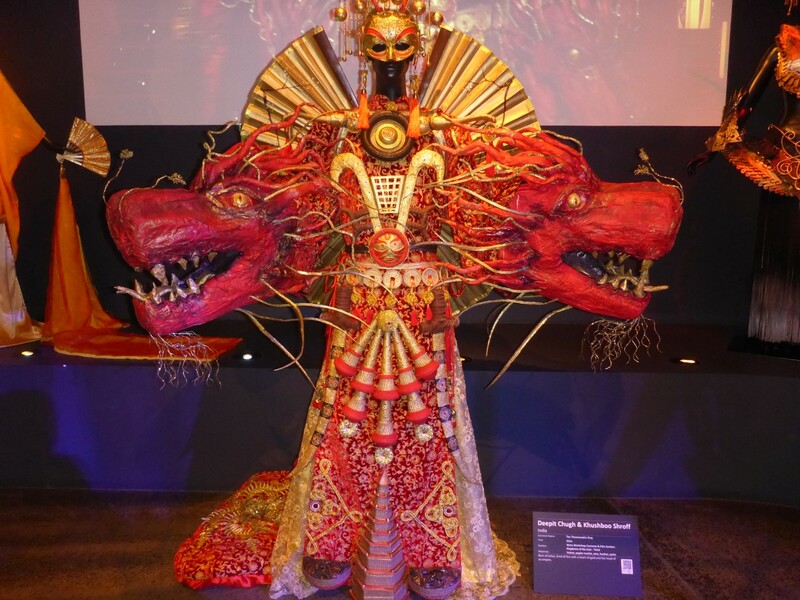 Firstly was WOW, the World Of Wearable Art. Wearable? I’m not sure. Art? Definitely. This museum contains all the costumes made for the annual fashion display held in the town. Nothing to do with Vivienne Westwood or the High Street, everything to do with some fantastic creations, based around different themes, which are displayed by being worn but are really modern art. 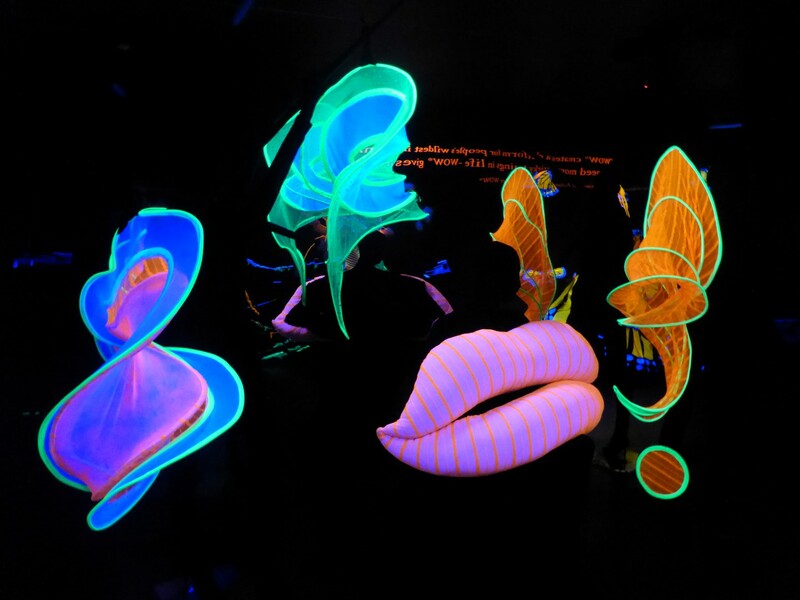 It was quite stunning and I was amazed at how people’s imaginations can come up with such designs. Yes, it is a costume. In the same building as WOW is a classic car exhibition. Once again I was very impressed by the variety and quality of the cars on display. 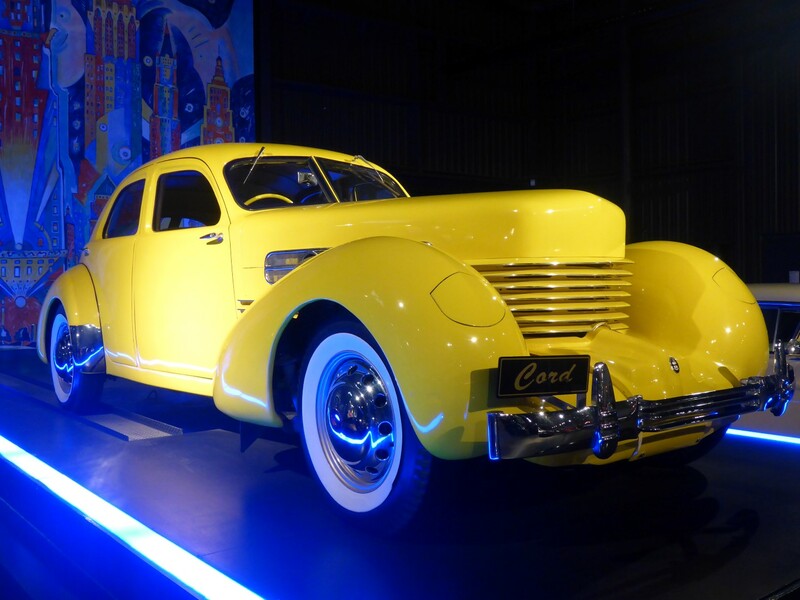 Kiwi’s really do seem to love old American cars and these were beauty on wheels. As with Warbirds and Wheels, there were many 1920’s and 1930’s models, along with 1950’s classics such as Cadillacs, Pontiacs etc. There was a nice display of older aero engines and in a building out the back were many 1940’s, 50’s and 60’s British cars, including a Ford Mk111 Zodiac, one of which I used to own. There was also a nice little display of Mini Coopers with an Italian Job theme to it. 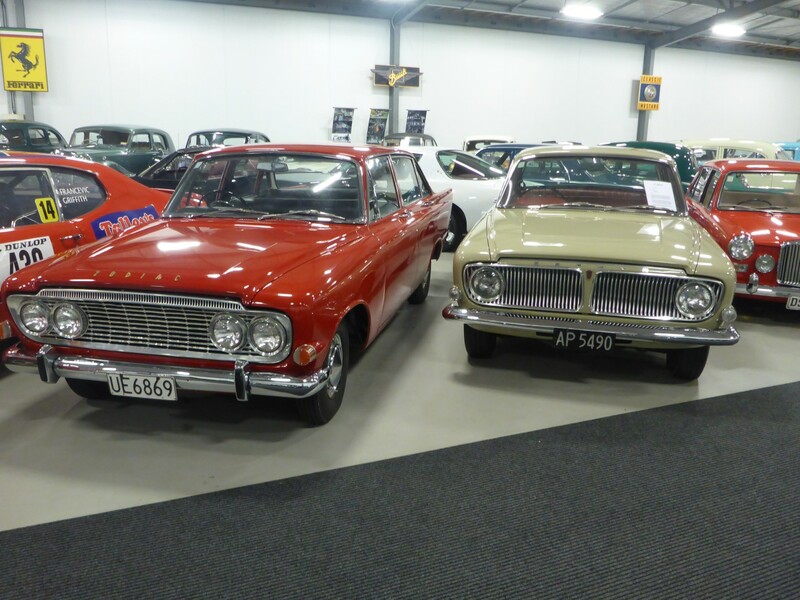 Ford Mk111 Zodiac and Zephyr, cars I used to own. With a perfect sense of place, these displays were housed in a building which used to be part of the British Leyland Triumph car assembly plant, based in Nelson in the 1970’s. Due to high import charges on new cars, a number of European manufacturers built assembly plants in NZ and imported the cars and vans in CKD format (Completely Knocked Down). Eventually the import taxes were dropped and the plants closed. 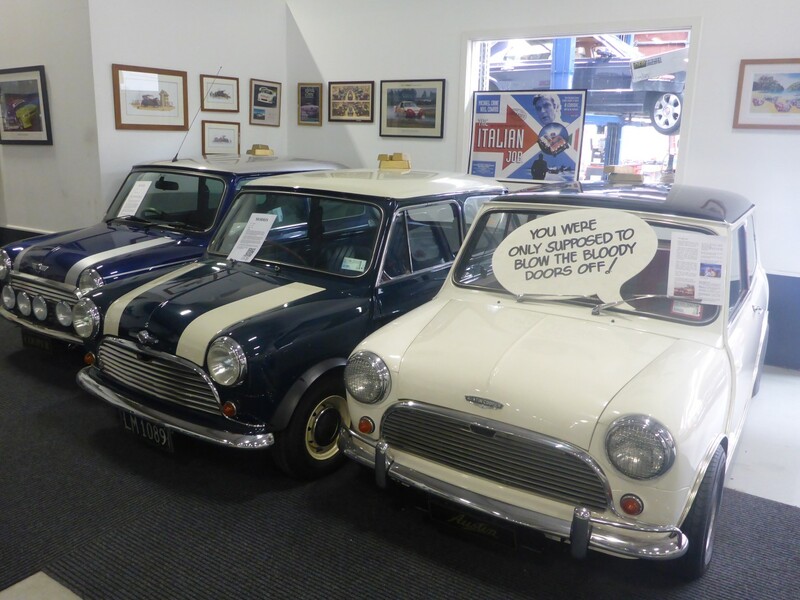 My second fix of engine oil and enamel was enjoyed at a visit to NZ Classics Museum. When you pull up outside a place and see a Vincent Twin, a very pretty yellow and Black 1970’s Desmo Ducati and an early Harley Davidson sidecar outfit parked outside, you just have to wonder what lies in inside. 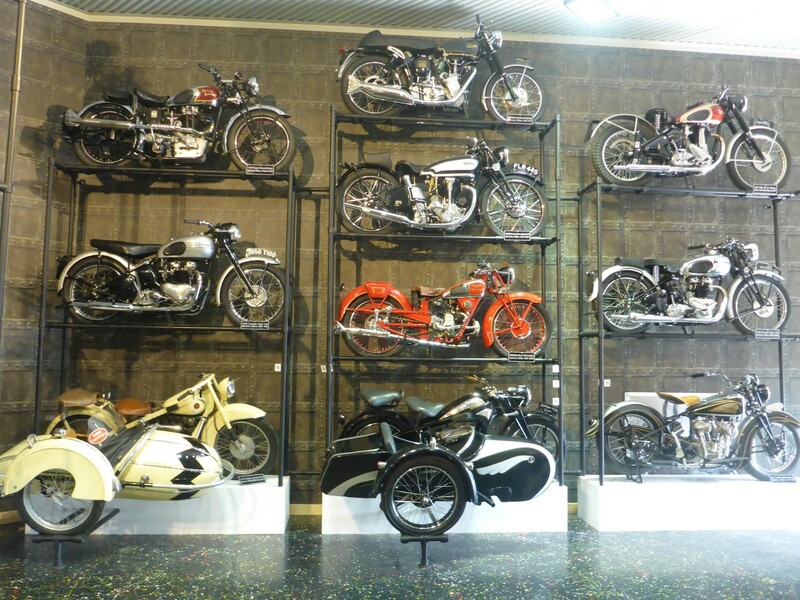 The answer is 290 classic bikes, of every age, make and description, that the millionaire owner has collected from around the world! Most of them restored to a very high standard, and displayed all over the walls as well as the floors. 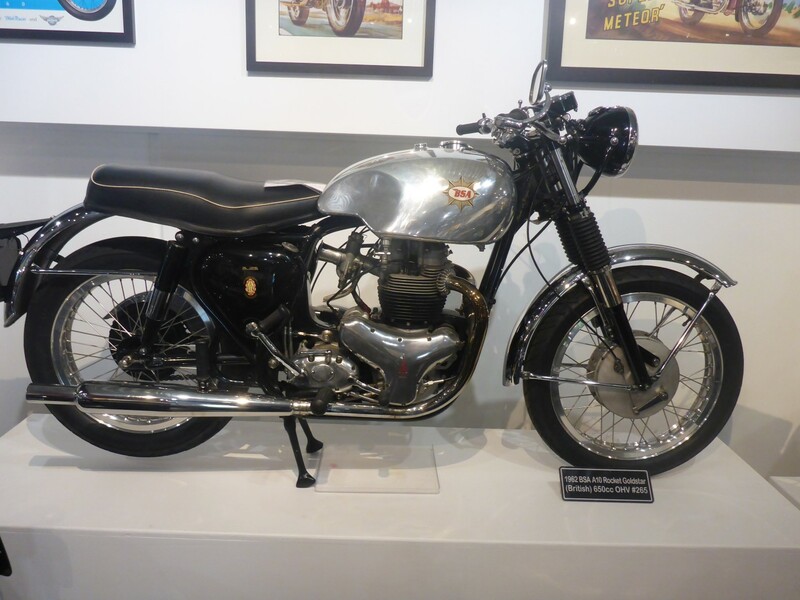 A huge variety of British and European bikes, plus some interesting old American models too. I’m not a fan of modern Harleys. Pretty much the only thing they have going for them is that they’re motorcycles and their V Twin engine. But the old ones are interesting and often look quite pretty. 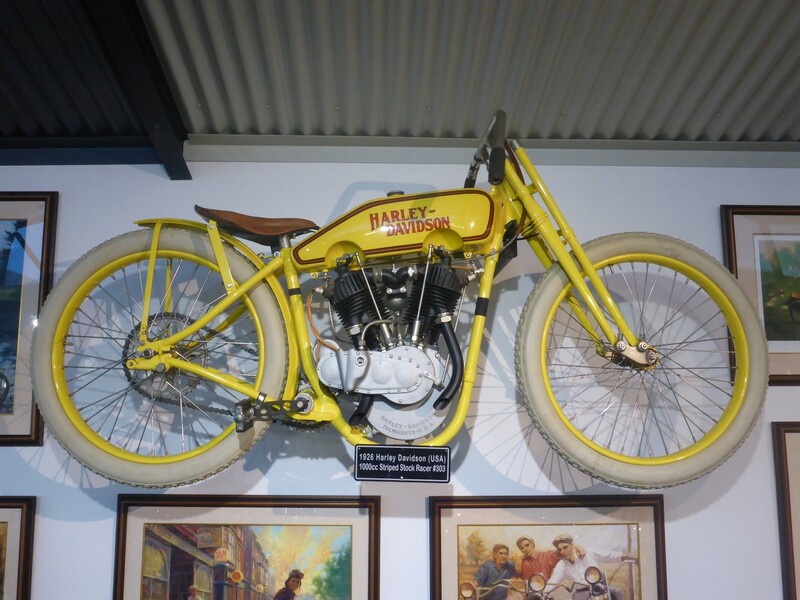 When you add in the plethora of early century European bikes, it was one hell of a collection. You might be tempted to ask me, ‘Geoff, just how many old vehicles can you look at?’ To which my reply would be, ‘How many do you have?’ But I can safely say that the last couple of weeks had left me quite replete. 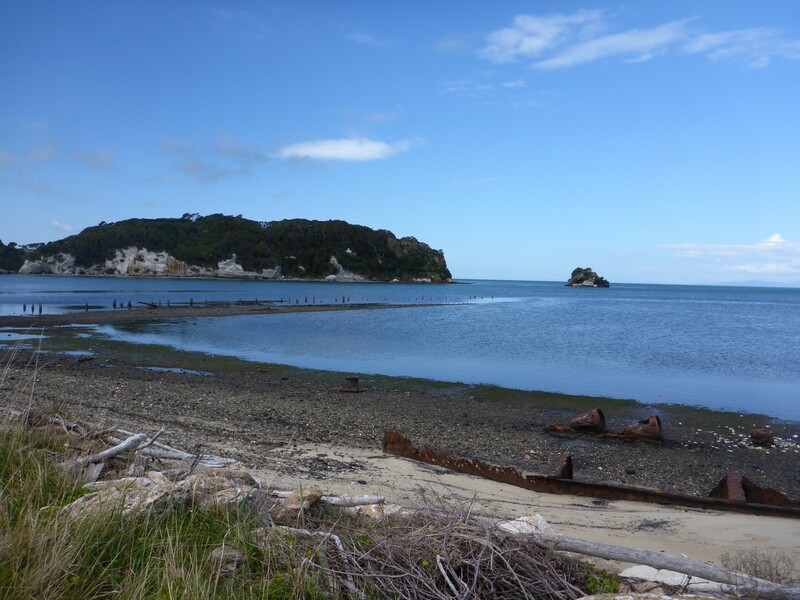 Having spent some of my time dealing with shipping and Carnet issues, I felt the need for some wind and fresh air so I took off on my sweet running, freshly serviced bike to explore the peninsular north of Nelson, which includes the Abel Tasman National park. A ride up through Motueka and Takaka got me to Collingwood, the most northerly town on the south island as far as I could tell. Not far past that lies Cape Farewell and the Farewell Spit. I was pleased to be able to park the bike up and take a walk around some of the viewing sites that the DOC thoughtfully provides. Farewell Spit is scythe shaped tongue of land that curves its way across the top of Golden Bay and is a very important bird sanctuary, so access is limited. 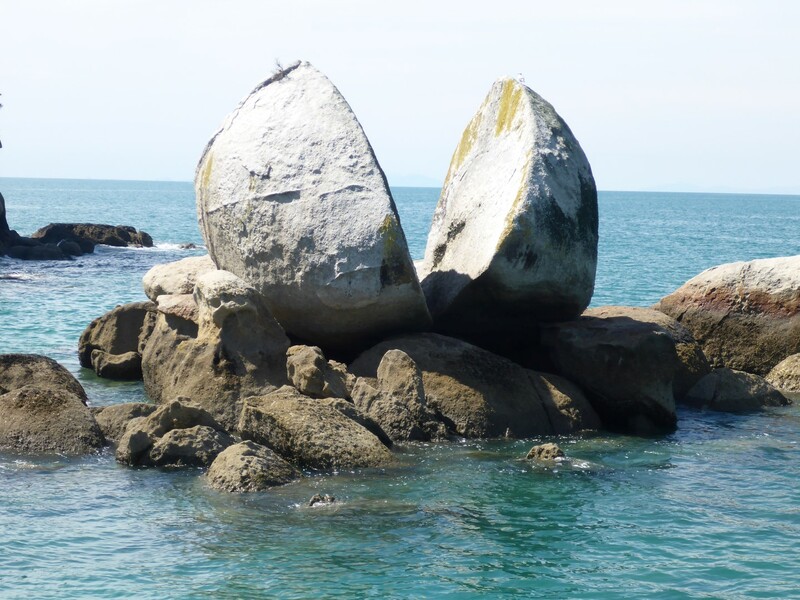 However I enjoyed a warm, sandy walk down to one of the beaches where I could admire some nice tree covered clumps of rock that had been separated from the land by erosion. Yes OK, I’m easily pleased! Top of the south island, up at Farewell Spit. The road up there was great fun to ride, especially with an unloaded bike, and the worn wheel bearings didn’t seem to be affecting the handling at all. I’ve become very impressed by Kiwi drivers. Even the quick car drivers will pull over to let a bike go past on the twisty, hilly roads. These hills have pull-ins on them so that slow vehicles can move over, often without having to slow down, so as to allow the faster vehicles trapped behind them to get past. There is a great deal of voluntary discipline behind this and it works well. Saturday evening was Speedway. Not bikes on this occasion, although that sport is very popular in NZ. 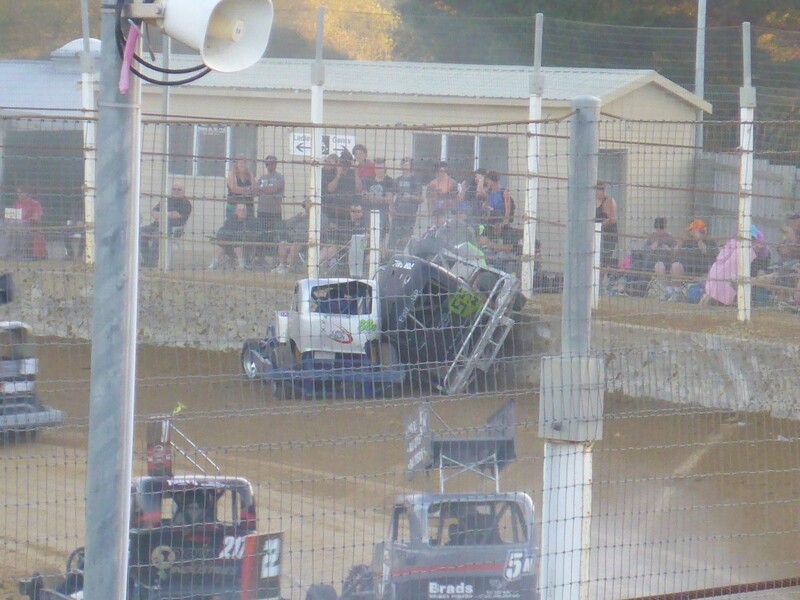 ‘Speedway’ involves cars and is what we would call Stock Car racing. 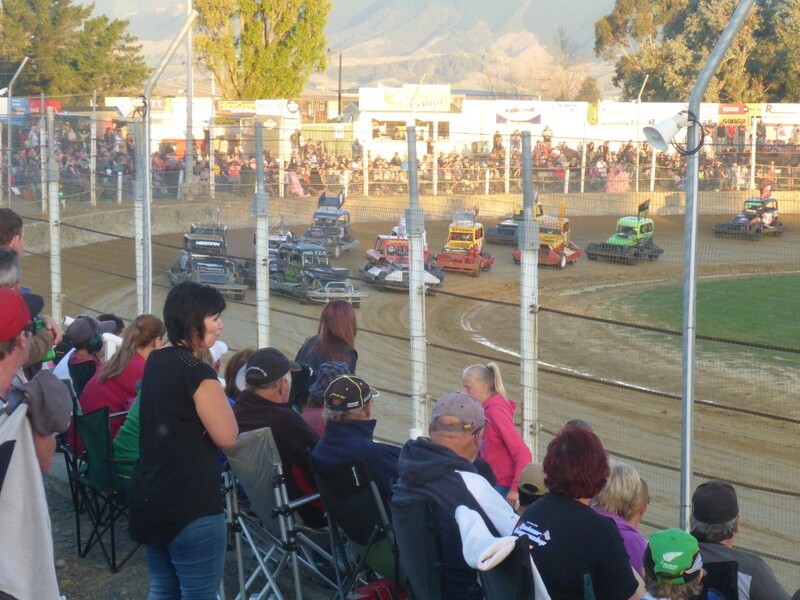 It takes place on a sandy, oval track, and caters for various classes of cars including Super Stocks, Production Stocks, Mini Stocks (for young racers) and TQ’s. These are very small cars that use 750cc motorcycle engines, mostly Suzuki. The racing began on the dot at 7pm and was fast and furious. Dashes, bashes and crashes in abundance, excellent value for our £7.50 entrance fee. The final race took me back to my twenties when I used to go to Wimbledon and Crayford race tracks to watch Banger Racing. 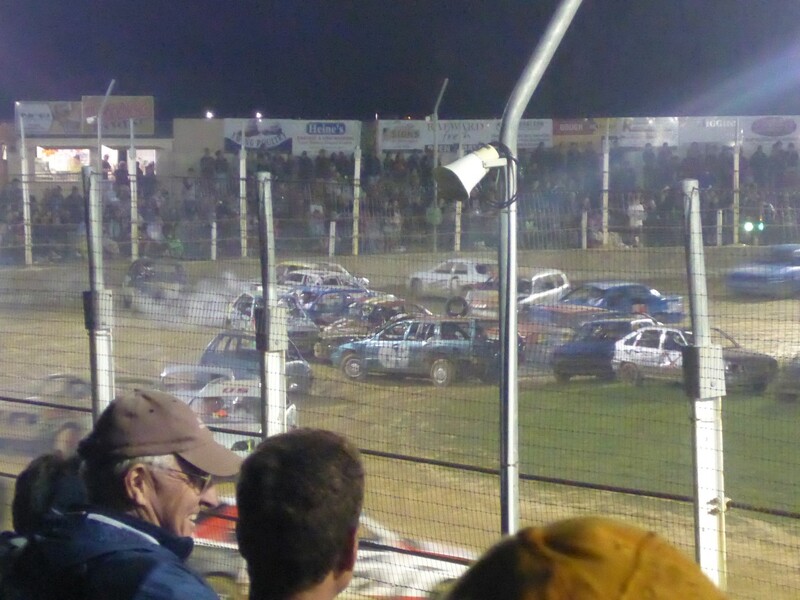 It was a Destruction Derby, where the last car still able to move around the track is declared the winner. In my day this was a fast and furious event where destruction really was the name of the game. The drivers did their utmost to smash their opponents’ cars to pieces. This version was somewhat tamer and the cars were slowed down by the the effects of the track having been turned into mud by means of copious amounts of water, and by having bald tyres on the cars. They’re all standard saloons (no glass in the windows and safety cages installed, of course) and it was still good fun to watch them lose bumpers, bonnets and various other bits, albeit in slow motion. Plenty of smoke, steam and mayhem to round off a great evening out. My last day in Nelson was a Sunday so Guy, Bronwyn and I decided on something different to round off my visit. 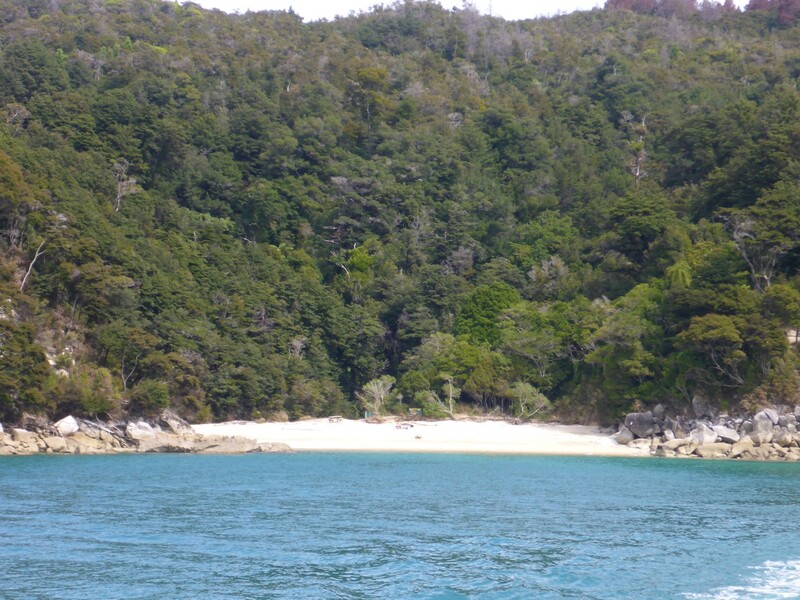 We took a boat trip up the coast past the Abel Tasman National Park and the beaches of Golden Bay. We travelled up to Kaiteriteri in Guy’s car instead of taking the bikes, giving us more chance to chat. It was lovely and sunny, just right for being out on the sea. We had a bit of a result because the boat company have a special offer where if a native Kiwi brings two or more foreigners with them, they go free. So $225 became $156 – £25 each. Fantastic. Naomi seems thrilled to be on the road. In the car park we met a couple of young British Woofers, George and Naomi. They’d bought a couple of Honda Postie bikes and had all their luggage attached to them using some garden shed racking that George had knocked up. Naomi had never ridden before and she’d taken her NZ Compulsory Basic Training before they set off. She was now learning very fast, especially on the gravel trails they’d been on. I was impressed by her courage and I’m sure they’ll have a great year together. Quite inspirational. In order to take on passengers the boat simply runs aground on the beach, drops a gangway onto the sand and then reverses off once they have boarded. No jetty, no fuss. There are various stopping points on different beaches as the boat heads north, and passengers are able to get off and on as it suits them. Some just want to enjoy an otherwise unreachable beach, others take to the tramping tracks that go through the national park. The skipper explained that much of the area used to be settled but has now been mostly abandoned. Some of the land is still in private hands but most of it has been incorporated into the national park. There is an access track to the lower beaches, where there are a number of properties, but before long it stops and there is just a walking track going north with a few DOC campsites. The area has a number of salmon farms and Bronwyn was telling us that the farmers get very frustrated by the number of seals that come to eat their stock. Seals are a protected species so the farmers struggle to deal with them. The seals can get very aggressive towards humans who come between them and their dinner. One of the pretty beaches. On the way back home after our trip we stopped at a place selling fresh fruit and I bought some Nashi, which is a cross between an apple and a pair. Very nice and sweet, but even nicer was the fresh fruit ice cream they sold. Guy has a fund of funny stories from his racing days and Bronwyn is a clever and intelligent woman with a great personality. We had a great day out. 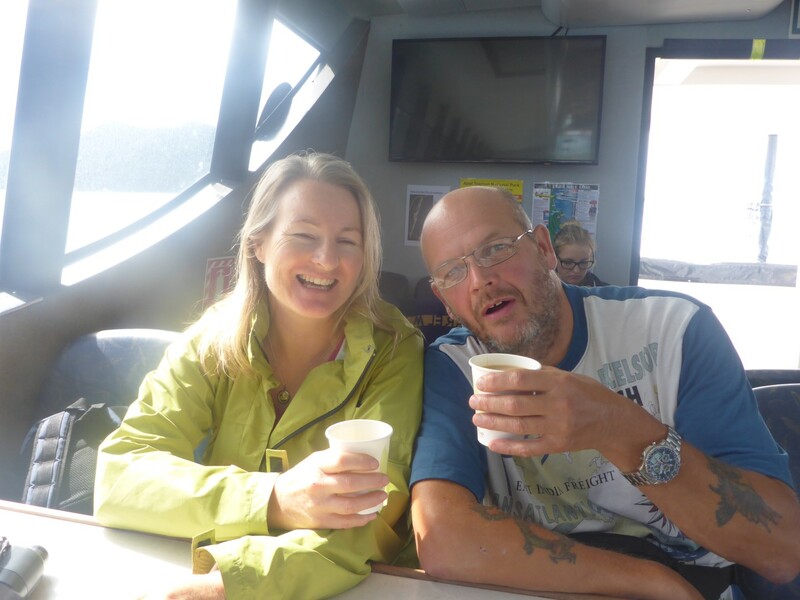 Bronwyn and Guy enjoying tea together on the boat. Unfortunately Steve had been unable to join us on any of our jaunts due to work and family commitments but he came over to Guy’s place for a chat one evening, mostly about bikes, and I went over to his place too, where I met his wife and daughter. I always enjoy talking to former AA colleagues, reminiscing about people and events. Steve, like me, was happy with his AA experiences, which made our chat all the more enjoyable. But my sojourn in Nelson had to come to an end, as had my time in the south island. I’d had a fantastic time in Nelson, visited and seen some amazing places and things, spent time with great people. I’d realised there’s definitely a difference between the north and south islands, not always easy to pin down. Perhaps it’s just that the north is busier and more crowded (a very relative term in NZ) and the south is more open and empty. They’re certainly different geographically. I’d met more native Kiwi’s in the south anyway and was left with an impression of a people who are very independent but welcoming to strangers. But time was running out and I needed to head north.